No, I have not yet read Caroline Glick's new book, The Israeli Solution: A One-State Plan for Peace in the Middle East. But, as even Caroline can tell you, I'm an old "one-state" hand. - that Israel will indeed be a democracy and a Jewish state. - that a "state of Palestine" is the beginning of the end of Zionism and the state of Israel as they cannot coexist due to Arab/Muslim rejectionism and uncompromising hostility that has nothing to do with politics but of religion and culture. There are many resources that shore up convincingly my approach and many have I published here at the blog over the past decade. 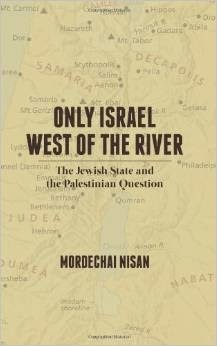 One book, recently published, that you should read, and its just less than 150 pages (Caroline's book is 350 or so), is that of my friend, Dr. Mordechai Nisan entitled "Only Israel West of the River". By the way, my copy of his 1977 "The Arab-Israeli Conflict, A Political Guide for the Perplexed" is also well-thumbed. In short, the book treats "the national Jewish character of Israel, the danger of domestic Arab challenges, and the imperative of Israeli rule throughout the area west of the Jordan River". It also deals with demography and "arranging Jewish-Arab accommodation and political stability". Nisan proposes what he terms "the only reasonable political solution for a problem that is more than one hundred years old. The two-state solution, currently monopolizing political discourse, is a non-starter". I agree. In its seven chapters it presents facts, clarity of thought, a reasoned approach and no "messianism". I do not like the term "settlements" that he employs, I'll admit. "Communities" is my preferred word.